- 4 yrs., 6 mos. 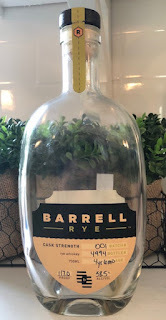 Barrell is one of the few "craft" whiskey companies that has really been able to take the world by storm. Their business model is a bit different, however, not only acknowledging the fact that they are a Non-Distilling Producer, or "NDP," but embracing it and marketing as such. They seem to take pride in transparency, and for this reason alone they have been a breath of fresh air. Plus, it doesn't hurt when your sourced bourbons seem to frequently win awards and accolades. I haven't yet gotten around to trying one of those bourbons, but I couldn't pass up their first rye release when it came out. Barrell products come with a somewhat steep price tag, relatively speaking, so it wasn't an automatic decision, but in the end it was one I was glad I made. The nose, at first, was incredibly off-putting. When I first opened it up (and even on the next few pours) I got a strong whiff of ethanol singing my nose hairs (of which there are many). Eventually, however, that ethanol note disappeared, perhaps evaporated off, and other notes were able to come through, including natural cherry (as opposed to the cough syrup kind), even with a bit of tartness on the notes. It also had a more earthy, almond note to it. All and all, once that ethanol seemed to burn off, it smelled really good! More importantly, though, even when that ethanol note was hanging around, this rye tasted amazing! It was sweet up front with a mild spice providing just enough kick to counterbalance the sweet. It was tones of molasses or brown sugar, balanced out by a Christmas-y cinnamon spice. It also had light pine notes and even a hint of dark fruits, like black cherry or plum. I couldn't quite place my thumb on it. As this rye opened up, though, it became a caramel bomb. Pour after pour I found myself taking a sip and then licking my lips for a while before diving in for the next sip. The cinnamon spice still stuck around, but this was caramel all day, rounded out just a bit by those dark fruit notes. This was Barrell's first foray into rye, and it was a great success! I loved everything about this rye (even despite the off-putting nose at first), and I would recommend this to anyone as a great example of a traditional rye. I certainly place this on par with Kentucky Owl Rye or even Michter's Toasted Barrel Rye, which I loved. Their second batch is sourced in part from Poland, which has me intrigued. Given how good this one was, there's a real possibility I give that one a try as well.